Rob Cross faces Michael van Gerwen in a top-of-the table clash as the Premier League Darts heads for Cardiff, with the battle for the four spots in the Play-Offs at The O2 intensifying. 'The Gentle' suffered his fourth defeat of the campaign in Liverpool last week against Price, who in winning took the Austrian's spot in the top four. There is no doubting the headline match of the night in Cardiff as the top two collide and with five games remaining it is Cross who continues to set the standard ahead of Van Gerwen. 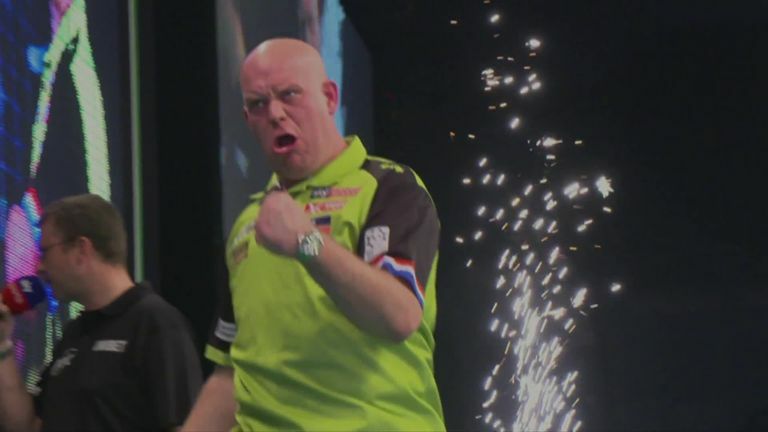 Cross defeated Peter Wright to remain at the top of the standings after Liverpool and victory over the Dutchman would go a long way to ending the three-time world champion's record of topping the standings ever since his debut season in 2013. Both men, who have each suffered two defeats in the campaign, come into the blockbuster match in good form but it was Van Gerwen who enjoyed a dominant 7-2 victory when they met in Dublin. A round-up of all the action from Week 11 of the Premier League in Liverpool. Smith is in desperate need of an upturn in form as he targets a first win in four in the Premier League roadshow, but he faces a tough task against Price who has top-four aspirations. 'Bully Boy' finds himself at the foot of the Premier League table and has struggled to build on his impressive run to the final at the World Championships. Price, who was one dart from victory against Van Gerwen in Belfast, is full of confidence ahead of playing on home soil but will be wary of a repeat defeat to Cross, after losing on the opening night of the Rotterdam double-header. Wade arrives in Wales in a rich vein of form after he secured a weekend double of Players Championship titles - his third success in the past eight days. 'The Machine' has responded well to the setback of defeat against Suljovic in Belfast and will be confident of beating seventh-place Wright, who is without a victory in the competition since beating Van Barneveld in Aberdeen. Wright would need a flying finish to the campaign to stand a chance of making the play-offs but 'Snakebite' is likely to play a pivotal role in determining who qualifies for The O2.